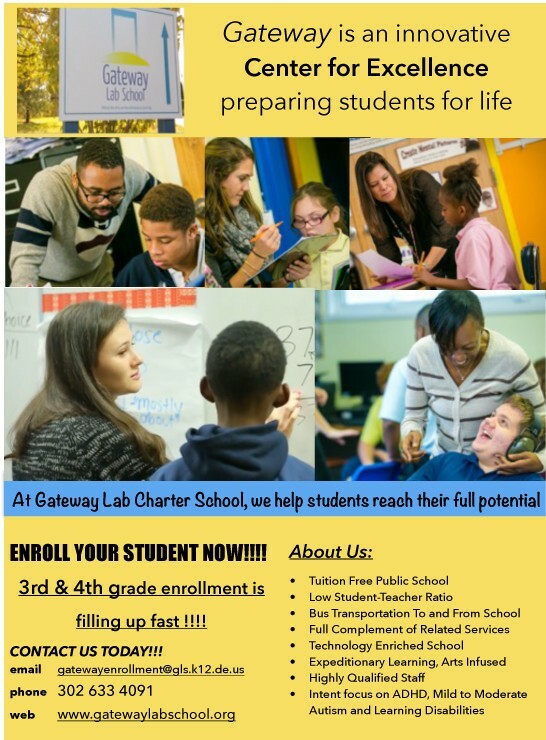 Gateway Lab Charter School is a state approved, public charter school centrally located in New Castle County. The schools unique design allows students with a variety of disabilities to find their path to a successful education. Gateway has established itself as a well-managed thriving charter school focusing on a model of specialized education services. Gateway’s core beliefs hinge on the fact that “all children can learn” when surrounded by a community that respects one another’s individualities and diversities. Gateway has an intent focus on creating a culture that allows every student to feel safe so they can be themselves. With a strong focus on creating a learning environment for students with ADHD, mild to moderate autism and learning disabilities Gateway is rethinking what classroom instruction looks and feels like. With smaller class sizes Gateway’s classrooms are designed for mobility with intent focus on a multisensory layout. With a variety of multisensory tools, furniture, technology and thoughtful instructional planning our students are able to release their energy in ways that will not impede the learning process. Picture a classroom where students can move and learn at the same time, teachers can use the entire space to teach and learning happens everywhere, every day. Gateway is strategic in its academic planning by setting achievable goals for each individual student leading to an overall goal for the entire school. Gateway students understand, often for the first time in their academic experience, what they need to do to achieve that rigorous goal in front of them. It is very common to hear our students talking about their personal growth and comforting other students on how they can achieve theirs. In 2015 – 2016 Gateway students were challenged to achieve a school wide reading goal of 65% on the baseline assessment, Measures of Academic Progress or also commonly known as MAP. The MAP assessment is a measure of personal growth and not measure of grade level proficiency, which allows Gateway to develop, detailed personalized goals for each of our students. Gateway students met that challenge head on with 80% meeting their personal reading goals. Gateway has invested in programs like the Wilson Reading program to support our lowest preforming students in meeting their goals. In 2015 – 2016 we had 35 students participating in our Wilson Reading program. We were very excited to see our data show that 80% of our students in the Wilson Reading program met their growth targets. Seeing this success prompted us to expand the Wilson Reading program to serve more students in the 2016 – 2017 school year. Gateway recognizes these gains do not come without consistency and commitment. In 2016 Gateway will be returning all of its inspiring and energetic teachers and administration to continue its quest of being a Center for Excellence in specialized education. We have invested in our instructional program by adding an Instructional Coach and Educational Diagnostician to support our instructional team. At Gateway we recognize that technology is in every aspect of our lives and that our students do not know a world without it. With that in mind Gateway has invested in school wide technology and is proud to be a one to one laptop school. With investments to improve our schools web based infrastructure every student will have access to a variety of computer-based programs. Embracing technology and all it has to offer we are able to combine rigorous academics with technology and create a highly structured, prescribed curriculum for our students. Please support our Center for Excellence by donating to our school today. We have a Donation button on the front page of our website. www.gatewaylabschool.org Because we are a 501c3 organization every donation is tax deductible. Tim brings with him nearly 20 years of experience. He has helped develop and grow from concept to graduation, 14 schools in Philadelphia serving students who have been pushed out, dropped out and those who needed a more specific program to help them find success in school. He has also worked with schools in surrounding states to help develop and turnaround failing schools. Most recently Tim worked with a non-profit organization in Philadelphia to create a charter school where students who where disengaged could re-engage and be re-energize about learning, re-connect with teachers, and, while working with their parents and teachers, set goals for after high school. Headshot by Shannon Adelson, Adelson Media, Inc.